Yes the man that you really shouldn’t try and annoy is coming to Marvel Universe Miniature Games very soon. So what will he bring to the game? Well for a start he is the only size four model you can place on the table at the moment with most humans being size 2 and at level 17 he is twice the cost of anyone else. So obviously he is a good guy and can only play for the avengers, he isn’t overly fast but with a strength of 6 he is going to smash something, hopefully this will drop in my FLGS on payday so I can treat myself ‘if’ I manage to get a bit more painting done. 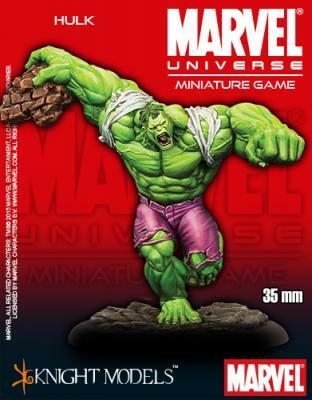 How will your opponent shriek when you drop this on the table, well after swearing at you for leaving a dent in the table he probably wont worry to much to begin with as at full health the Hulk suffers from -2 power but as he takes damage he gets upto +1 power and +1 attack whichis really going to put the hurt on someone late game, or early game if they have focused on the Hulk. Defensively he seems pretty average, but I will see when I get him out on the table.